I first got to know of Butter Studio when reading an article on new halal cafes in Singapore. Ever since then, I have always seen pictures of yummy treats from their cafe and have also been following them on instagram, but just never seem to get a chance to drop by any of their outlets. So imagine my excitement when my bunch of friends told me that they were planning to have a birthday celebration there. I was skeptical at first, thinking that most stereotypical cafes won't allow reservations and the food would always be overpriced and taste mediocre. Oh boy, was I wrong! 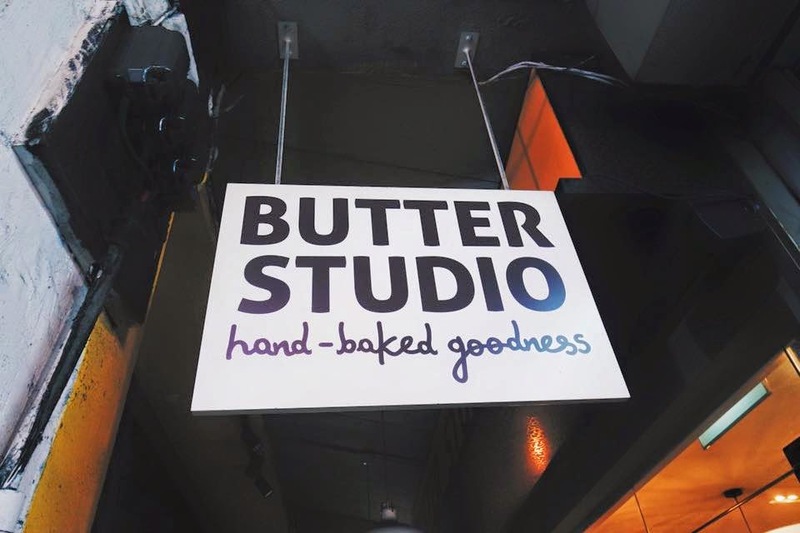 Location & Amenities: Butter Studio is located right opposite Jalan Besar Food Centre. I have always assumed that it was near Jalan Besar Stadium (which is just five minutes away from Lavendar MRT) but I was wrong. This cafe's nearer to Farrer Park MRT - approximately 10 minutes walk away. I wouldn't say that it is very far or hard to get to but neither was it that easy or near. It's kinda somewhere in between, I guess? GoogleMap will definitely help. Place & Ambiance: The whole studio took our breath away from the moment we stepped in. Size wise, the whole place was really tiny and more on the cosy side, but we could see so much effort being put into decorating the space. From the classic wooden furniture to kinfolk and frankie magazines to vintage knick knacks displayed all around, it is pretty obvious that Butter Studio pays attention to the details. There are also handmade paintings on the walls from LY Yeow and a few other displays from local artistes, including the background music - which was a playlist filled with covers from Singaporean youtubers. Nice touch to the support local movement! Ambiance wise, it was rather quiet when we came in with little sounds of chatter here and there from other groups of patrons - we were the noisiest one there because there were twelve of us at one long table. I cannot emphasize further on how cosy the whole atmosphere was at Butter Studio, especially with such homely decorations. Everything is instagram worthy here, expect to hear alot of camera snaps. Staff & Service: I mentioned earlier that I was skeptical when my friend wanted to host her boyfriend's birthday dinner here because it is after all a cafe, and most cafes won't allow big groups or loud noises what more reservations. To my surprise, she did make a reservation for the twelve of us! I walked into the cafe and was greeted by a friendly little waitress named Sarah who then directed us to our long table. They reserved a whole cosy corner (which looked like it already took up 1/4 of the store) for us and were very accommodating when we asked for extra chairs. There were two other boys who were very quiet and reserved, but nonetheless they were really fast on their feet to serve the other customers as well. They didn't do anything over the top, but they did what they were paid to do very nicely, so kudos to the three of them. Taste & Price: I find that some stuff were too overpriced (eg. the chicken pie for $8.90) but at the same time there were stuff that you can get in a bundle (eg. the 3 for $10 cupcakes or 2 for $12 tarts) at a cheaper rate. Their main dishes were really worth the money, in my opinion. Taste wise though, I couldn't say much about the cupcakes. Fizzy didn't come along so I bought him takeway cupcakes to taste at home and he claimed that his cupcakes were too dry and felt like they have been on the shelves the whole day. He ate all three, without giving me a bite so wo bu zhidao. I only bought three things off the menu - but I did get to have a little taste of everything because our bunch of friends - we have this unhealthy habit of sharing calories. Heh. I'll list down a few opinions (from my friends and I) on the treats below. Lemon Meringue Tart (SGD6) - It has a very zesty-sweet taste to it. The crust was really thick and crunchy. The filling underneath the meringue was very lemony and the huge lump of meringue was simply sweet and soft like a big cloud of marshmallow. A just nice mix of sweet and sour. Sea Salt Nutella Tart (SGD6) - Definitely one of my favorites! The crust was a little bit softer as compared to the Lemon Meringue Tart (it was meant to be soft baked I guess) but the overall flavor has just the right amount of salt and nutella blended into one. Thick and sinful. I'm craving for it now. Butterscotch Velvet Cupcake (SGD3.50) - I hope I got the name right! It was something along that line. The butterscotch flavor was a little too overwhelming to me and I couldn't really taste the sweetness of the cream cheese and cupcake base. I still prefer Twelve Cupcakes' moist ones though. Iced Nutella (SGD5.50) - A whole lot of milk with super thick Nutella all over the bottom and the sides. I had to stir everything in before it turned into what seemed like Nutella milk, but I enjoyed licking the Nutella off the straw. It was a wrong choice to have this alongside such a big platter though, made me feeling really full and queasy afterwards but damnnnnn, this was sinfully yummy. Sausage Lover's Platter (SGD15) - Just enough carbs, protein and vege for a dinner dish. It doesn't look like a whole lot but this made me pretty full though. Maybe because I had the Iced Nutella on the side. One of the boys had the exact same dish as me but needed to go for another side dish. Depends on one's tummy I guess. This blog post was not written under any pressure or endorsement of any of the parties mentioned. Reviews and information on www.wolvestruckwanders.com are written based on my own initiative unless otherwise stated. All opinions here are as always, are my own. homg. the dessert looks delish!